The little one is graduating next week. Err.. I mean, she is moving up. Their moving up ceremony is going to be on the 13th of March. As we all know, the Holy Week is coming that's why schools are pushing the end of classes earlier than usual. Anyway, I went hunting for a white or off-white dress for my daughter over a week ago. I made sure I stormed the stores before other mommies so I can have more dresses to choose from. First stop was Shangrila Plaza at EDSA. I spotted a nice dress at Zara but it was not pretty enough for graduation. Periwinkle has a white dress fitting the graduation theme. However, sizes 5 or 6 were out stock. The next stop was SM Megamall to check on SM Kids if they have graduation dresses on display yet. I tried checking every brand at the department. To my relief, I was able to spot around 10 dresses or so from brands like Purple Candy, ELLE, Barbie etc. Here are the ones that my daughter tried. I like this dress a lot. She looks so cute in it. This one is simple and elegant too. I didn't like the fit and the length of this one. Too simple and too white. I don't like. Her most favored dress. Very pretty but the spaghetti strap kept on falling off her arm. 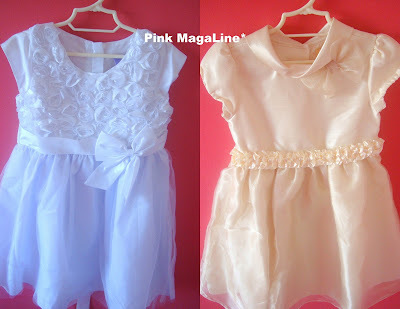 These are the dresses I bought for my daughter.. Purple Candy white dress with bow belt and tulle skirt and Alli & Ella ecru dress with pearls on the belt. Now the problem is which dress to wear for the moving up ceremony. My daughter likes the white Purple Candy dress a lot, while the Alli & Ella is my favorite. I also bought ecru shoes, white stockings and a headband to pair her dress with. A separate post on that is coming. Laterssss. Wow, what a steal! I never thought dresses for kids nowadays would be that expensive!